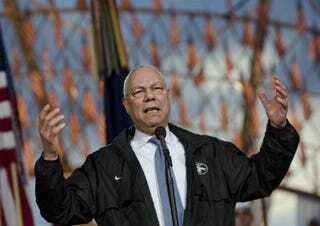 Miami Herald columnist Leonard Pitts Jr. dismantles Secretary of State Colin Powell’s post-9/11 pep talk that called for Americans not to walk around in fear. Pitts argues that the nation has done just that. … So everything that has happened since Powell spoke — the curtailment of civil liberties, the domestic surveillance, the demonizing of all things Muslim — is troubling, but predictable to any student of American history. In his new book, "Manufacturing Hysteria," author Jay Feldman traces the depressing line from a German-American being lynched during World War I to the murders of Arabs after 9/11.